Biryani - We come across this dish every other day, in Indian restaurants, books, websites, and in our own homes. But, have you ever wondered what it really is, what sets it apart from other dishes, how it is to be served, etc.? Biryani is a spicy Indian dish, made of rice and vegetables. It is mostly flavoured with an elaborate spice paste or rich gravy. The layers of rice and gravy are arranged and cooked together, allowing the flavour of the gravy to seep into the layers of rice, giving it an awesome appearance and irresistible flavour. Most biryanis are also topped with spices and herbs like saffron and mint before cooking, which further accentuates their taste and especially their aroma! A biryani is usually spicier and more elaborate than pulao. It takes more time to prepare, but is worth every moment spent because the taste is special. While pulao is usually cooked in a pressure cooker, a biryani is cooked in a handi, which locks in and intensifies the flavour. However, if you do not have a handi, you can always cook it in a deep non-stick pan. Since biryani is quite heavy, it is usually served at the end of the main course. It can also be had as a one-dish meal because it is quite filling. As it is quite flavourful by itself, you do not really need a subzi or dal to go with it. However, many people are unaware of this and serve their biryani with kadhi but that tastes good too, so never mind! 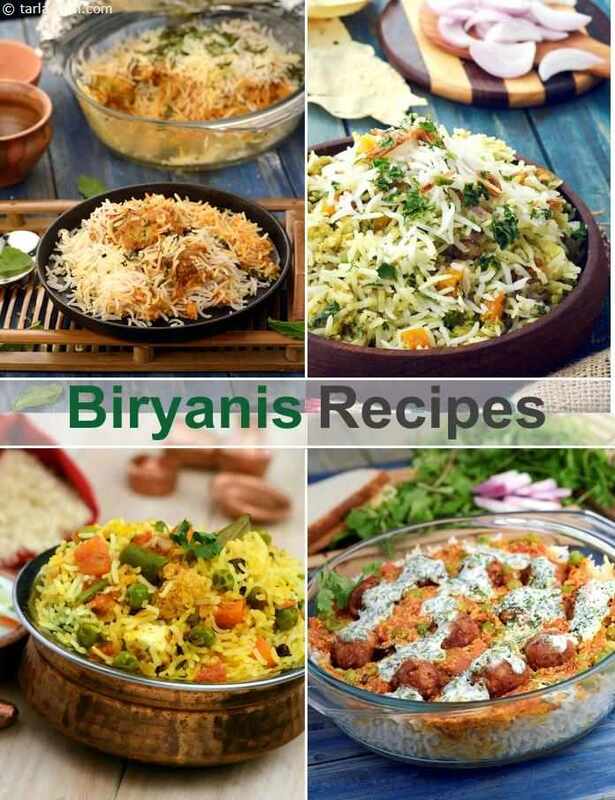 Although the traditional Vegetable Biryani is very famous, many people still tend to associate biryani more with its non-veg variants, which is in a way true because non-veg biryanis are extremely popular. However, with a little creativity you can many innumerable veg varieties too! Apart from the usual veggie loaded biryani, you can also make something special with paneer, chana or koftas in it! Such unusual options will definitely surprise your guests and gain you a lot of praise. 1. Always use long-grained rice like Basmati. 2. Use the right quantity of water to cook the rice, such that it is fully-cooked but each grain is separate and not mushy. 3. The vegetables used in the biryani should be cooked to the perfect level, not over or under cooked. 4. If possible use a handi for cooking a biryani as the flavours blend better. 5. After the biryani is made, do not mix it vigorously. Always mix gently or else the grains will break, making the biryani mushy like a khichdi! However, before you embark on your biryani tour, be prepared to spend time on it. Biryani is not something you prepare in a hurry. Although it is an opulent and satiating one-dish meal, quite some time and effort goes into preparing it. Some biryanis are made in a quick-fix way, cooking everything together at one shot. However, in a traditional biryani, the rice and gravy are cooked separately, layered and then cooked together for 30 minutes to an hour to get the awesome ‘dum’ effect! Patience makes your biryani perfect!! Wanna be ‘the’ culinary goddess? This Bread Kofta Biryani helps you bag the crown. Please everyone with this exquisite dish that has glorious layers of rice, gravy and sizzling golden koftas baked to perfection. Sit back and enjoy the attention! Delicious masala-stuffed vegetables, rice and dal are carefully cooked together in this one of a kind recipe. A great one dish meal, Toovar Dal and Mixed Vegetable Masala Khichdi when served with buttermilk, also makes a fabulous potluck lunch. Handi Hot Pot ia an ideal lunch box meal that has the goodness of rice and veggies packed well. Coat the vegetables and rice with the ground masalas and cook in a handi, for a gorgeous treat.